In advance of Nevada’s Republican caucus on February 4, we’ve compiled a list of important facts about Latinos and immigrants in the state. These facts provide important context for the significant economic, cultural, and electoral power of Latinos in Nevada, the state with the fifth-highest Latino population nationally. 1. Nevada’s Latino population is substantial. In fact, 26.5 percent of Nevada’s 2.7 million residents are Latino. In contrast to Florida, where Mexicans make up 15 percent of the Latino population, in Nevada, Mexicans make up 78 percent of the Latino population. 2. The Latino population has grown significantly in the last decade. It rose to 26.5 percent today from 19.7 percent of the population in 2000. 3. Latinos comprised 46 percent of the overall population growth in Nevada in the last decade. This growth helped the state gain an extra congressional seat after the 2010 census. 4. 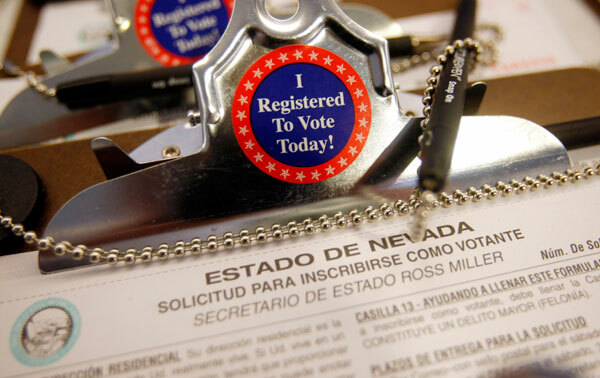 There are 224,000 eligible Hispanic voters in Nevada. That’s 14 percent of all eligible voters in the state. 5. Latinos played an important role in Nevada’s 2008 GOP caucus. According to CNN entrance polls, 41 percent of Latino caucus voters chose Mitt Romney while 25 percent picked Sen. John McCain (R-AZ). Romney handily won the state 51 percent to Ron Paul’s 14 percent and Sen. McCain’s 13 percent. 6. Latino voting trends increasingly favor Democrats. Latino support for Democratic candidates grew between 2004 and 2008. John Kerry won the Latino vote 60 percent to President George W. Bush’s 39 percent in 2004. President Barack Obama won the Latino vote 76 percent to Sen. McCain’s 22 percent in 2008. 7. The Latino “firewall” in the 2010 elections included Nevada. Analysts from across the political spectrum agree it was the Latino vote that made the difference in 2010 between re-electing Majority Leader Harry Reid (D-NV) and holding the Senate, or losing the seat and potentially losing the Senate. Sen. Reid won a whopping 90 percent of the Latino vote against Republican Sharron Angle, allowing him to win the state by 5 points where polls two days before had him behind Angle by two points. Angle took a hard anti-immigrant line in the election, producing a series of racially charged ads with extremely negative portrayals of immigrants. Sen. Reid’s victory helped the Democrats retain a slim three-seat majority in the Senate. 8. GOP candidates face an uphill climb among Latino voters. In Nevada, President Obama holds a lead with Latino voters over both Republican candidates—66 percent to 17 percent in a head-to-head matchup against Romney and 71 percent to 23 percent in a contest against Newt Gingrich. In the Senate race Democrat Shelly Berkley leads Republican Dean Heller 74 percent to 16 percent among Latino voters. 9. Immigration reform receives strong support across ideological and demographic lines. A national Fox News poll from December is consistent with years of public opinion research: Two-thirds of all voters stated that undocumented immigrants should be allowed to remain in the country and become eventual citizens after paying back-taxes, learning English, and passing a background check. Two-thirds of Latino voters nationwide support a pathway to earned citizenship according to a recent Univision/Latino Decisions poll. 10. Nevada’s immigrants contribute significantly to the state’s coffers. According to a 2007 study, immigrants contribute $1.6 billion per year in state and local tax revenue. Even with no state income tax, unauthorized immigrants paid $133.5 million in state and local taxes in 2010. Philip E. Wolgin is an Immigration Policy Analyst and Jonathan Goldenberg is an intern with American Progress.